Fenugreek (Trigonella foenum-graecum) is an annual herb with yellow flowers and seed-containing pods that are native to Asia and the Mediterranean. The seeds have been used throughout history for cooking, flavoring, and healing. Fenugreek has a strong flavor of maple, so much so that it's a common flavoring in imitation maple syrup. In their raw form, however, fenugreek seeds taste bitter; heating or roasting reduces the bitterness and brings out the sweetness. For centuries, fenugreek has been taken to promote health and well-being. It was used to treat digestive and respiratory ailments, and it has a long history of use in women's health—to induce labor and help with childbirth, and as a treatment for gynecological issues like painful menstruation and uterine problems. While other benefits are being studied, today fenugreek is most widely used and researched for two purposes: as a galactagogue, something that can help a breastfeeding mother increase her breast milk supply, and as a way to reduce blood sugar levels in people with diabetes. Fenugreek is the most popular herbal remedy used around the world for increasing the production of breast milk. When 124 lactation consultants were surveyed in 2012 about folk remedies to promote lactation, fenugreek was the most commonly recommended method. Although it's employed by millions of women to stimulate breast milk, only a few studies have investigated fenugreek for this use. In one 14-day study, researchers reported that new mothers taking fenugreek tea increased breast milk production that helped babies gain more weight. In another study, the volume of pumped milk from mothers who consumed fenugreek tea doubled compared to that of other mothers—2.5 ounces compared to 1.15 ounces. In another study, mothers taking 600-milligram capsules of fenugreek seeds three times daily for a month had an increase in breast milk production of 20 percent—though that wasn't a significant difference compared to the placebo group. Fenugreek is thought to boost the production of breast milk due to an effect on the stimulation of sweat production, and mammary glands are sweat glands that have been modified by hormonal stimulation. Numerous animal studies and preliminary trials in humans show fenugreek may help to lower blood sugar. In a two-month, double-blind study of 25 people, use of fenugreek (one gram a day of a standardized extract) significantly improved some measures of blood sugar control and insulin response as compared to placebo. Triglyceride levels decreased and HDL “good” cholesterol levels increased, most likely due to the enhanced insulin sensitivity. Another study where 18 people with type 2 diabetes took 10 grams a day of powdered fenugreek seeds mixed with yogurt or soaked in hot water, those taking the seeds soaked in hot water saw a 25 percent decrease in fasting blood sugar, a 30 percent decrease in triglycerides, and a 31 percent decrease in very-low-density lipoprotein, a type of fat that carries cholesterol and triglycerides through your bloodstream. Those who consumed powdered fenugreek seeds mixed with yogurt saw no significant changes. Fenugreek may also help prevent the onset of diabetes. One three-year study found that people with prediabetes who took five grams of fenugreek powder twice a day before meals were significantly less likely to develop diabetes, possibly due to a decrease in insulin resistance. LDL "bad" cholesterol was also significantly reduced. Fenugreek does pass into the breast milk, but it's believed to be safe for both mom and baby when used in moderation. The U.S. Food and Drug Administration has rated fenugreek as Generally Regarded as Safe (GRAS). Still, always consult a doctor, lactation consultant, or herbal specialist before taking any herbal treatments. Herbs are similar to medications. They can have side effects, and they can be dangerous for you and your baby. You should be aware that fenugreek can cause your breast milk, urine, and sweat to smell like maple syrup. And since it passes to the baby, it can also cause your baby’s urine and sweat to smell like maple syrup. Be sure to tell your baby’s doctor that you're taking fenugreek. There's a serious illness that's characterized by a maple syrup smell, and if your doctor doesn't know that the maple syrup smell is from the fenugreek, he can misdiagnose your child with maple syrup urine disease. The most common side effect of taking fenugreek is diarrhea. Diarrhea can affect both you and your child if you start high doses of fenugreek too quickly. But, you can usually avoid stomach issues if you start this herb at a low dose and gradually increase it. You shouldn't use fenugreek if you're pregnant. This herb has been used to induce labor, and it can cause contractions, premature labor, and miscarriage. Fenugreek may act like estrogen in the body and be unsafe for women with hormone-sensitive cancers. Given that fenugreek can lower your blood sugar levels, use caution and speak with your doctor if you're taking diabetes medications, such as insulin or drugs for hypoglycemia, as fenugreek may enhance their effects. This may cause excessively low blood sugar, and you may need to reduce your dose of medication. Fenugreek can thin your blood. Don't use it if you're taking blood thinners (anticoagulant medication) unless you're under the direct supervision of your doctor. Allergic reactions are possible. 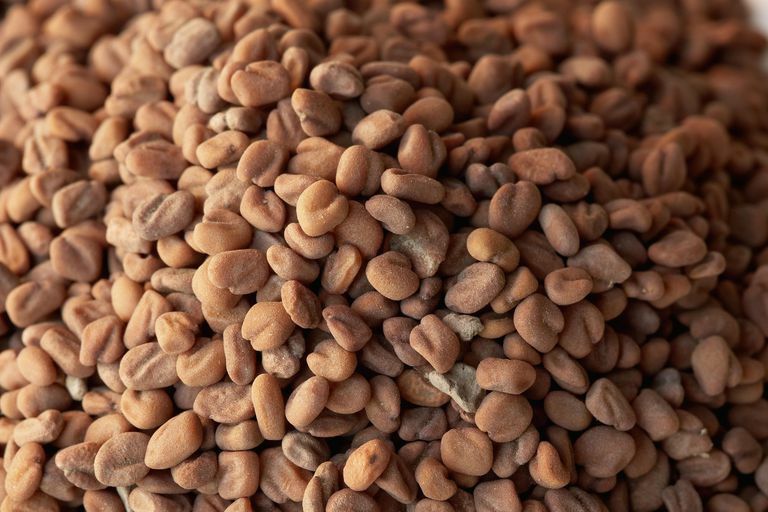 If you have asthma, or you're allergic to soy or peanuts, you may also be allergic to fenugreek. Fenugreek is available as seeds, capsules, and tea. Because the seeds are bitter (heating sweetens them), fenugreek may best be taken in capsule or tea form. Debitterized powders are available, but even they're often considered unpalatable without the addition of a flavoring agent. Wide-ranging dosages and differing preparations have been used in studies, so there is no single recommended dose. If you're taking fenugreek to increase production of breast milk, talk to your doctor, midwife, lactation consultant, or an herbal specialist to find out which dose is best for you. In general, you can begin by taking one 610-milligram capsule (a commonly available dose) three times a day. Then, slowly increase your dose until either you smell of maple syrup or you're taking three capsules three times a day. To make fenugreek tea, place one to three teaspoons of fenugreek seeds in eight ounces (one cup) of boiling water. You can drink fenugreek tea up to three times a day. Fenugreek is thought to work well in combination with other breastfeeding herbs, such as blessed thistle, alfalfa, and fennel, and it's often one of the main ingredients found in commercially available nursing teas. When taken as directed, you can typically expect to see an increase in your breast milk supply within one week. Studies in people with type 2 diabetes have used a range of fenugreek—from five to 100 grams of powdered fenugreek seed taken one to two times daily for four days to three years. A dose of 1 gram daily of an extract of fenugreek seeds has also been used. Talk with your primary care provider before taking fenugreek in any form or dosage. Self-treating a condition like diabetes and avoiding or delaying standard care may have serious consequences. If you opt to try fenugreek, keep in mind that supplements haven't been tested for safety and because dietary supplements are largely unregulated, the content of some products may differ from what is specified on the product label. To help ensure you're buying a respected brand, look for products that have been certified by ConsumerLabs, the U.S. Pharmacopeial Convention, or NSF International. These organizations don't guarantee a product is safe or effective, but they indicate it's undergone testing for quality. You can get other tips on using supplements, but if you're considering the use of fenugreek, tell all your health care providers about any complementary or integrative health approaches you use. Giving them a full picture of what you do to manage your health will help ensure coordinated and safe care. Damanik R, Wahlqvist ML, Wattanapenpaiboon N. Lactagogue effects of Torbangun, a Bataknese traditional cuisine. Asia Pac J Clin Nutr. 2006; 15 2: 267- 274. Gupta M, Shaw B. A double-blind randomized clinical trial for evaluation of galactogogue activity of Asparagus racemosus Willd. Iran J Pharm Res. 2011. Winter; 10 1:167-172. Humphrey, Sheila, BSC, RN, IBCLC. The Nursing Mother’s Herbal. Fairview Press. Minneapolis. 2003. Kassaian, N, et al. Effect of fenugreek seeds on blood glucose and lipid profiles in type 2 diabetic patients. Int J. Vitam Nutr Res. 2009 Jan;79(1):34-9. Schaffir, J, Czapla, C. Survey of lactation instructors on folk traditions in breastfeeding. Breastfeed Med. 2012 Aug;7:230-3. Epub 2012 Mar 16.